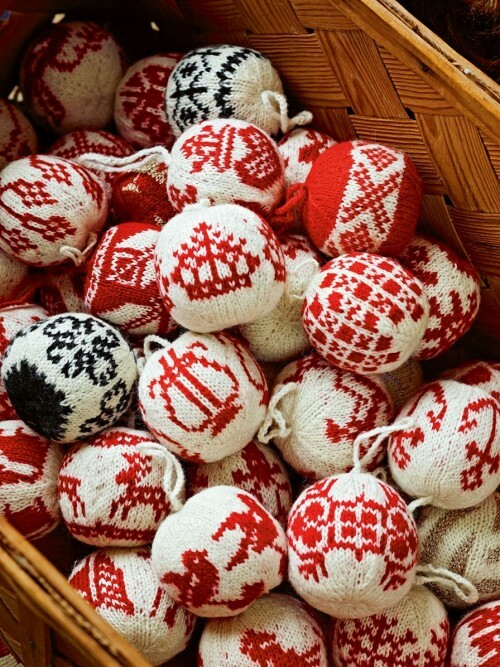 Did you see the knitted baubles on Kirstie Allsop’s Christmas show, last week? I thought this year’s Kirstie Allsop Christmas show a great improvement on last year’s, featuring so many more achievable crafts. Gifts and goodies you might actually want to make and give. But back to the balls. I’ve seen so many of these in the shops and on Pinterest. Yes, I have bought red and white 4 ply yarn. I’ve not attempted fairisle knitting before but it can’t be that difficult, can it? And I’m used to working in the round from my sock knitting. I’ve not yet bought this book although I was tempted. Fortunately for my Christmas bank balance the book is now sold out on Amazon. I’m off to source some free patterns. At a push I think I could probably make some up but if anyone has come across some of these free charts please let me know. A great year and a broken leg. Those are super cute. Can’t wait to see what you come up with. Great ideas for next year. Oooh, good tip about Kirstie’s Christmas! I didn’t bother watching it this year, cos I thought last year’s was so ridiculous (neon artistry, what?!) — but I shall go and catch up on iPlayer now I think, since hubby is still working. Whilst not ticking all the boxes it was certainly more pleasurable to watch than last year’s and a good deal more ‘Christmassy’. But don’t expect to come away with tons of ideas! I’ve seen those bears on Pinterest. Definitely one for next year. 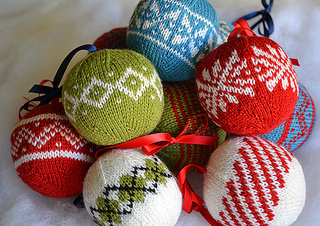 Free knitted bauble patterns to download. Yes, you are right. Thank you! Ha! I’ll show you mine if you show me yours! I did enjoy “meeting” Arne and Carlos and, much as I love watching Kirstie’s shows, found this one as predictable as usual and full of stuff I’d never make. Why show a tree decorating or jumper competition when more ‘how to’ crafts could be shown? I sometimes do wonder at what audience she is trying to pitch to but I did find it pleasurable to watch with one eye on my gecko pattern, which perhaps says it all!